Ram has loaded its newest pickup with upscale touches including reclining rear seats, a 12-inch touchscreen, active-noise cancellation, headlights that steer around corners and a Harmon Kardon sound system with 19 speakers. Of course, this vehicle doesn't exist, at least not yet. 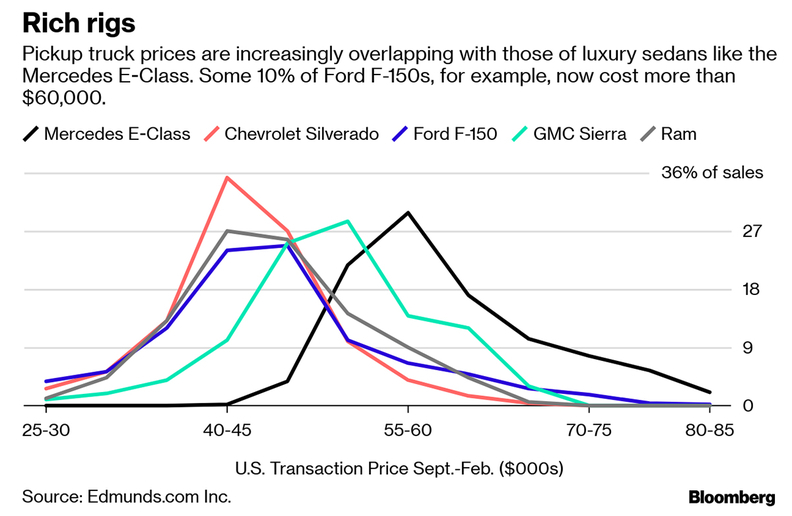 Though American factories are stamping out increasingly opulent and expensive pickups — some cracking the $80,000 mark — the creature comforts and tech-drenched amenities on these machines still fall years behind what buyers typically find on similarly priced luxury cars. Step into the top trim of a half-ton pickup these days, and you'll find a small herd's worth of buttery leather, enough bins and wireless-charging docks to keep things Kondo-tidy, excellent WiFi and a suite of active safety features such as lane warnings and automated cruise control. Impressive? Yes, but only relative to the rough-and-tumble recent past of the American truck. These kinds of features and digital safety chaperones have been available on Subarus for years now. What's missing from these trucks is the next level of opulence that comes standard on a swanky sedan that costs just as much. Truck infotainment screens still can't be navigated with hand gestures like those of a BMW, the glove compartments aren't stocked with fragrance "atomizers" like those at Mercedes, the sound systems can't be set to mimic the acoustics of the Gothenburg Concert Hall (like Volvo's) and none of these high-end pickups will drive itself around like a low, louche Cadillac — or, for that matter, a Tesla. The reason, of course, is such perks would cut the huge profit margin that comes with selling pickups in a country obsessed with urban cowboy street cred. While swanky sedans are now accented with soft-close doors, power sunshades and audio systems that protect eardrums in advance of a crash, top-shelf pickup trucks are still touting "Ice Blue" ambient lighting. Ford Motor trims the cockpits of its Lincoln utilities in "open-pore ash," though the fanciest versions of its main moneymaker, the F-150, are sold with "Genuine Wood" accents. At General Motors, the price on GMC's Sierra pickup can easily be pushed north of $70,000, but the infotainment screen never gets much bigger than an iPhone. Those opting for GM's Cadillac CT6, however, will enjoy an additional 2.2 inches of touchscreen. Evan Steiner, a ski dad with a Labrador Retriever, is one of many migrating from German sedans to a big, burly truck. He recently ditched his Volkswagen Jetta and bought a Toyota Tundra in a loaded configuration that starts at $50,330. "I was tired of having a Tetris puzzle every time I wanted to put stuff in the car," he explained. Steiner and his two kids gush about their new ride, but he had to pay extra for a bed liner. Moreover, he's puzzled that the steep sticker price didn't cover push-button ignition, which became table stakes in the luxury game years ago and is now available on the Jetta he jettisoned. The average price of a truck is now hovering at $50,000, in large part because of ultraexpensive models that fetch far more. To be fair, the price of a truck needs to cover a bunch of things the financial engineers in Stuttgart don't have to worry about — massive engines, a lot more steel and aluminum, tie-down anchors, bumper steps and LED lights. On a contemporary half-ton truck, a side mirror alone can double as a bathroom vanity and the running boards often extend and retract automatically. Manufacturers have also developed intricate systems to monitor and counteract swaying trailers. GMC trucks will soon have a "transparent" trailer feature, which creates a video feed from 15 different cameras so one can see behind her hitched rig. "There's a lot more capability and versatility on a truck, compared to a luxury sedan," said Phil Brook, GMC vice president of marketing. The cheapest version of Ford's market-leading F-150 starts at around $28,000, though one in 10 F-150 buyers spent more than $60,000, according to data from Edmunds. "They've really evolved into no-compromise vehicles," said Ford truck marketing head Todd Eckert. "But at the end of the day, a truck has to be a truck." He adds: "Fragrances and things of that nature are typically not things that our customers are interested in." Still, even with those caveats, the financial engineers have factored in plenty of cushion for these machines. Pickups remain the most profitable niche of the auto industry—up to $10,000 per vehicle—because of the wide gap between the price of the rigs and the cost of what goes in them. However, today's consumer is pretty aware and the profit padding hasn't gone unnoticed. In a recent survey, 68 percent of truck owners said that they felt pickups were overpriced, according to CarGurus Inc., an online marketplace for new and used vehicles. More darkly for truck-mongers, some 17 percent of those respondents said their next vehicle would not be a pickup. "I've started to wonder how much gravy there is in the pickup market going forward," said Madison Gross, director of customer insights at CarGurus. What's more, truck buyers likely pay more attention to the sticker price than those kicking the tires on a German sedan, because they are more likely to buy than rent. Recently, fewer than one in five of America's full-size trucks left the lot under lease, compared with 56 percent of premium luxury cars. "We can continue to expand on the top end, but at the same time continue to deliver to the core," Eckert said of Ford's spendy truck strategy going forward. "Obviously, we're always aware of what's happening across the industry." Ford has probably been keeping a close eye on Ram, its cross-town rival. About a year ago, the perennial third-string player unveiled its most lavish truck to date. The Ram rig was loaded with a ton of all-new goodies, including reclining rear seats, a 12-inch touchscreen, active-noise cancellation, headlights that steer around corners and a Harmon Kardon sound system with 19 speakers. 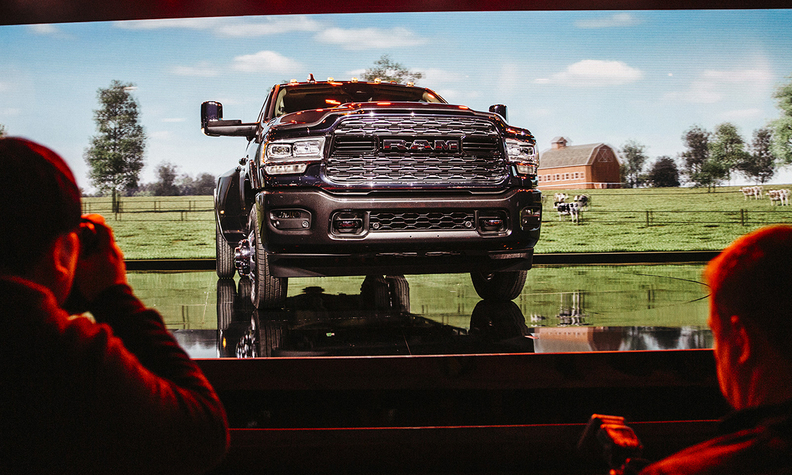 In the months since, Ram's share of the full-size truck market surged from 19 percent to 24 percent as it swiped spendthrift buyers from more pedestrian machines. GMC, meanwhile, is working on that little touchscreen. When asked if buyers can expect a higher gear of luxury on coming iterations, Brook, the brand's marketing head, said: "It sounds like you've been at some of our product-planning meetings." Most GMC customers can "buy anything they want," he said, and a little more than one-third of them have recently been opting for the brand's "Denali" treatment — it's most expensive trim. The trucks, in short, will be getting even fancier —and fast. The only question is whether the price will tick up even more. There are no doubt plenty of people who would drop six figures on an F-150. Soon, they may get their chance.